Broadly speaking, the Balkan Peninsula may be divided into four areas which geologically are distinct. There is a central region, roughly triangular in shape, with its base resting upon the Aegean Sea and its apex in Servia. On two sides this area is bordered by belts of folded beds which form on the west the mountain ranges of the Adriatic and Ionian coasts, and on the north the chain of the Balkans. Finally, beyond the Balkans lies the great Rumanian depression, occupied chiefly by undisturbed Cretaceous and Tertiary strata. The central region, although wedged in between two belts of folding, is not affected by the folds of either, excepting near its margins. It consists largely of crystalline and schistose rocks. The core is formed by the mountain masses of Rhodope, Belasitza, Perin and Rila; and here Palaeozoic and Mesozoic beds are absent, and the earliest sedimentary deposits belong to the Tertiary period and lie flat upon the crystalline rocks. Upon the margins, however, Cretaceous beds are found. The eastern parts of Greece are composed almost entirely of Cretaceous beds, but nevertheless they must be considered to belong to the central area, for the folds which affect them are nearly at right angles to those of the western chains. 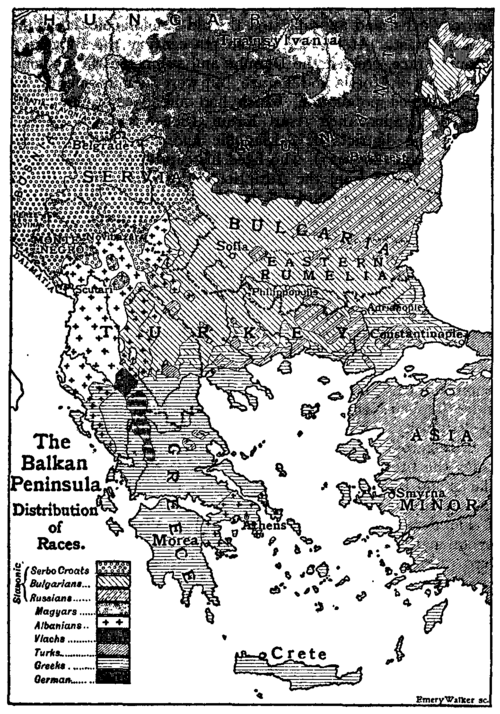 The following figures show the area and population of the various political divisions of the Balkan Peninsula in 1909; see also the articles on the separate countries. For full details as to the physical features, natural products, population, customs, trade, finance, government, religion, education, language, literature, antiquities, history, politics, etc., of the Balkan lands, see Albania, Bosnia and Herzegovina, Bulgaria, Croatia-Slavonia, Dalmatia, Dobrudja, Greece, Illyria, Macedonia, Montenegro, Novibazar, Servia and Turkey.